A total of 32 lactic acid bacteria (LAB) were isolated from Khanom-jeen, a Thai traditional fermented rice noodle. They belonged to the genus Leuconostoc (Ln), Lactobacillus (Lb), Enterococcus (E), Lactococcus (Lc), and Weissella (W), based on their phenotypic characteristics and 16S rRNA gene sequence analyses. The strains were identified as Ln. pseudomesenteroides (group 1, two strains), Ln. citreum (group 2, three strains), Ln. lactis (group 3, three strains), Lb. paracasei subsp. tolerans (group 4, two strains), E. faecium (group 5, three strains), Lc. lactis subsp. lactis (group 6, one strain), W. confusa (group 7, six strains), Lb. fermentum (group 8, seven strains), and Lb. plantarum subsp. plantarum and Lb. pentosus (group 9, five strains). Fifteen strains exhibited the inhibitory activity against Helicobacter pylori clinical isolates by spot-on-lawn method. Lb. fermentum P43-01 resisted to bile acids showed the broad spectrum of antimicrobial activity against H. pylori strains MS83 and BK364. These antagonistic effects were associated with proteinaceous compounds which are sensitive to α-chymotrypsin and pepsin. 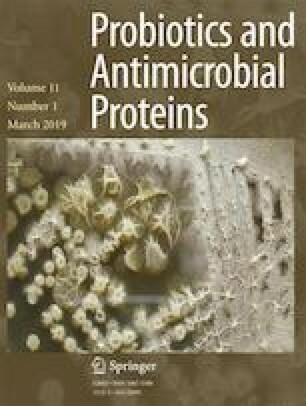 Results indicated that production of bacteriocin-like substances of selected strain might be the significant mechanism that exerted the inhibition on H. pylori. A potential strain could be used as probiotics in alternative or adjunctive therapy for a patient suffering from H. pylori infection. This study was financially supported by the Thailand Research Fund, Chulalongkorn University, and ASIA STAR TRADE CO., LTD, through the 2015 Research and Researchers for Industries Program (RRI) as a Ph.D. scholarship to S.T., National Center for Genetic Engineering and Biotechnology (BIOTEC), Thailand (Grant No. P-17-52209) to W.V., and was partially supported by the Grant for International Research Integration: Research Pyramid, Ratchadaphiseksomphot Endowment Fund (GCURP-58-01-33-01), Chulalongkorn University.